While there are many estates that produce Moscato in Asti, there are very few that specialize in its production. This is especially true of the small, artisanal farmers who rarely have the means to justify the costly equipment needed to make this sweet, lovable grape sparkle. The Morando brothers, who make less than 8,000 cases of Moscato d'Asti and work organically, are prized as much for their rarity as their quality. 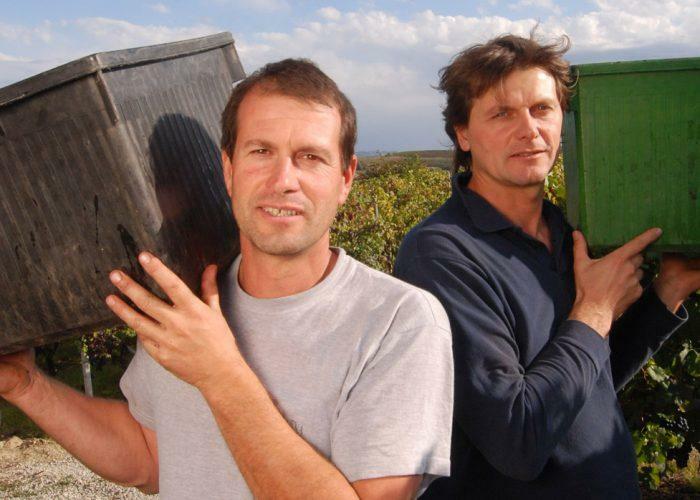 Giulio and Paolo Morando have 15 hectares of Moscato planted in the Bricco Francia cru, which is made up primarily of calcareous clay soils. While they make about 1500 cases of red, mostly Barbera, in Barbaresco, their passion is Moscato. As Marco De Grazia recently described "the bouquet transcends Moscato with unique nuances of sage and mint." The estate is also passionate about sustainability and has been working organically for over 30 years. Their vineyards have been something of a laboratory in the last couple decades as the brothers have worked closely with the University of Turin. Their uncle Albino has taught viticulture there for years and has carried out a number of experiments in Bricco Francia. His discoveries, along with those of Giulio and Paolo, have provided immense joy both for lovers of Moscato and sustainable farming.